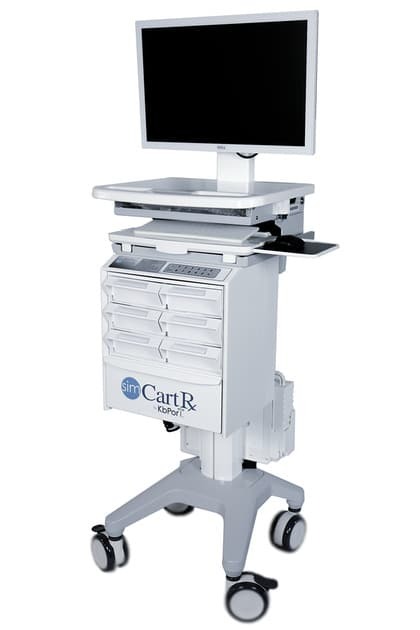 Hospital carts designed to reduce noise ensure optimal recovery for patients and improve overall patient satisfaction. Between the beeping of machines, the chatter of people, and the rattling of supply carts moving from room-to-room, it can be exasperating for patients who need to recover from an illness or surgery to achieve quality sleep. Many hospitals are trying to combat this noise problem by turning to solutions such as installing sound-absorbing ceiling tiles, using personal paging devices instead of intercom systems, and purchasing quieter equipment such as hospital carts with noise reducing features. Many hospital carts are being designed with lightweight aluminum to reduce the amount of noise they produce as they are moved around the hospital floor. Hospital carts are more in use than ever, with several kinds of carts being utilized on each floor throughout the hospital at any given time. Medication carts are one of the most widely-used carts in a hospital. They often come with locked drawers, either manual or electronic, and dispense the proper amount of medication to help reduce errors and keep track of inventory. Other carts, including rolling medical supply carts, carry important supplies from patient-to-patient. Doctors and nurses use these carts to store bandages, disinfectants, scissors, gauze, and IV supplies. These carts are especially helpful in patient areas where rooms aren’t available, such as in the emergency room, and supply cabinets might be located too far away. Emergency use carts, such as anesthesia carts, procedure carts, and pediatric emergency carts, are also used throughout many areas of a hospital. Lightweight medical carts with wheels that are versatile for movement and designed not to squeak help reduce the noise levels these carts can generate on any floor. Before the widespread use of medical workstations on wheels, the nurses station was commonly a place where a backlog of nurses and doctors could be found trying to complete several tasks at the same time. Many would be waiting for a computer, while others would be talking on the phone. The noise levels in these common areas increased the noise level throughout the floor, especially if the floors are hard tile which reflect, rather than absorb, sound. 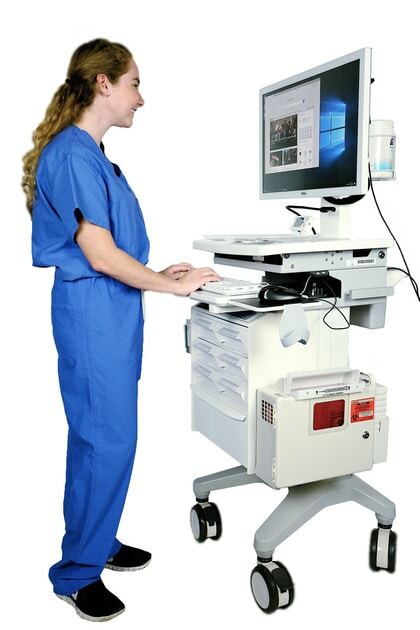 Mobile computer carts have helped to bring a lot of this work directly into the patient rooms. Doctors and nurses can quietly speak with their patient and enter information directly into their electronic health records system from their computer or tablet. Many phone calls can be bypassed with direct access to test results or pharmacy prescriptions. Because data can be entered during direct patient care, this lowers the number of nurses and doctors having to congregate in an area to complete computer work. More direct patient care leads to a sense of better quality care for both the patient and the provider, and it reduces the overall noise levels for other patients. The World Health Organization recommends noise levels of no more than 35 decibels for a proper environment to recover. Most hospitals are operating at 65-70 decibels and above. In addition to replacing old equipment and investing in newer, quieter medical rolling carts, many hospitals are implementing other accessories to help lower noise levels across the board. Equipment with noiseless alarms that send alerts directly to devices of medical staff is one accessory that has been employed in hospitals with some success. Other accessories include quieter packaging for medical instruments and supplies, installing portable sound-absorbing screens between patients, and utilizing sound level monitors which alert staff when the noise level becomes too loud. Scott-Clark provides reliable cart power and battery management systems, point of care medication work stations, and offers a patented Flexible Mobile Cart Power Technology System. Contact us today by calling or filling out our convenient online form.